A leaking water pipe can go undetected for an extended period of time, slowly causing damage to your Hartford, Connecticut home. Water pipes are hidden behind walls and beneath floors and a slow leak is not easy to detect. Homeowners hate that there are usually no warning signs early on that will help identify the source of your leak. While we love helping people when they are dealing with water damage emergencies…at We Dri Fast we HATE when you have to experience it. The good news is that leaks can be stopped early, and there are things you can do to help identify leaks soon after they begin. It’s a good idea to check these things regularly or when you suspect you might have a water leak. How Can You Watch for Water Leaks? Under no circumstances is it normal to have water present under your sinks, but that doesn’t mean it’s not common. Check under the sink on a regular basis, looking for any standing water, staining, or condensation. Don’t pass over a wet spot that looks like it has dried, as this could be a sign of a very slow leak. You can run water down the sink and check the seals where your pipes connect to ensure they are not leaking. 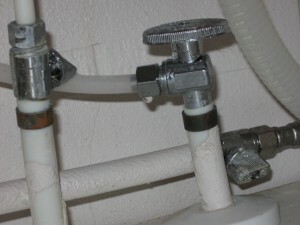 Don’t delay repairing even a small leak. Unfortunately, it’s not going to go away — but, the longer you wait means it will almost always get worse and cause more damage. It’s easy to check for leaks under the sink, but leaks from pipes in your walls are much more difficult to detect until damage is visible. In rooms that have excess moisture such as the bathroom, kitchen, mudroom or laundry room, be on the lookout for soft spots in the drywall or brown staining on the walls or ceiling. It’s possible excess moisture from the shower or a leaking pipe has been absorbed by the drywall. Also take a look at the caulking around your bathtub and shower. You want to make sure it is completely sealed to prevent water from entering your walls. If your drywall is damp and damaged, it needs to be dried or replaced depending on the extent of the damage as soon as possible. The last think you want is to be dealing with a mold problem on top of it. Third – How’s Your Water Pressure? If you suspect you have a water leak due to a decrease in water pressure or an increase in your utility bill, it’s possible that your leak is not causing damage, but it is certainly wasting water and should be repaired. Most often, the source of wasteful leaks are toilets that may run or have a slow leak that causes it to refill the tank periodically. If you know where the water meter is located, you can check it to help determine if somewhere in your home water is running. Some meters will have a leak indicator, and others will have a basic dial. Mark the location of the dial and refrain from using water for at least 30 minutes. Check the meter again, and if the dial has moved it’s possible you have a leak. Unfortunately, water leaks create the perfect environment for mold and mildew growth. Mold thrives in dark, damp environments, and if you have a slow leak mold is probably present. If you notice mold, but don’t see a leak, don’t assume there is not a leak—the moisture had to come from somewhere. Hopefully you are able to stop leaks before mold develops, but that’s not always the case. Identify the source of the moisture and fix it. If you have mold, call us at We Dri Fast, we have mold remediation specialists who can ensure the mold is completely removed and will not return. This is especially true if the mold is in a hard to reach area. Expect to be thoroughly satisfied at the conclusion of your job. If at anytime during the process you are finding that you are not completely satisfied or you have some burning questions please do not ever hesitate to contact one of the We Dri Fast owners. Amy Bloxam-Prihoda can be reached directly at (203) 410-1294 and Curtis Bloxam can be reached directly at (203) 410-5444.